I felt cold, icy fingers pressing on my shoulders. It was like a cold shawl dipped in ice that had draped itself along my shoulder blades and the coolness thrust through my body like a cold-stone sword. It wasn’t pain I felt. It was more of a whisper of frost whisking its way around my body. I opened my eyes and saw that I was all alone. No one was there. I cried. He was gone and wasn’t coming back. My beloved Pete was gone from me. He died in a tragic car accident. I was alone now—all alone. I was awake and the dawning sun was peering through my window curtains and peeking around the shades. I had learned to hate the sun. Since he left me sunlight was always a reminder that I shouldn’t be sad. It was a reminder to go out and enjoy life and yet it was the last thing I wanted to do. I punched my hand into the mattress and felt the coils spring back into my fingers. It hurt for a moment. That hurt I felt made me realize that I was still alive and had to move forward. I couldn’t curl up under the covers, cry, hide and wait for him to come back to me because he wasn’t going to. I forced myself to do three simple things everyday since he died: take a shower, brush my teeth and get dressed. Doing these things took effort. The sadness I felt inside was like a brick pulling at my heart and the tears that would pool up in my eyes would make me panic uncontrollably. I still had to move on. I still had to punch the mattress and keep going. After dressing myself in my dark denim jeans, high-heeled black boots and grey sweater, I wandered downstairs to look outside. It was fall now and the maple trees shone with their glossy orange, yellow and red leaves. Beauty no camera could ever capture. Autumn is a fleeting season. There are only a few short days that are truly crisp and sunny with fresh autumn air. I made myself some oatmeal with almond milk and berries for breakfast. I paid some bills. I checked my Facebook page. Then I went outside to the garage. I looked at 2 cars staring back at me. One was Pete’s car and the other was mine. I decided to take my car that day which was a simple, white, speedy Toyota Corolla. After backing the car down the driveway and putting it in reverse, I decided to just drive somewhere. I didn’t know where I was going. I just drove. I wound up at my favorite place we used to go: Indiana Dunes. It was where we had our second date. It was also a beautiful place to enjoy the fresh, autumn day. I took my boots off and rolled my pant-legs up and started to walk through the sand letting it squish and squash in between my toes. I let the water of Lake Michigan wash up my legs and splash backwards and repeat. The water wrapped itself around my feet in a complete circle, like it was giving me a hug and then it was gone so quickly. It was like my life with Pete. After eight years together and nearly 6 months of marriage, it was all gone like that. I put my head down into the wind, slouched my shoulders and shoved my hands in my pocket as I felt the breeze off the lake roll around my body. I sauntered on down the lakeshore with no purpose. Tears came rolling down my cheek. The wind rustled my long, golden curls which got stuck in the tears that streamed down my face. As I wiped my hair out of my eyes, I stopped suddenly and looked up. I’d nearly tripped over someone’s feet. Suddenly I a three sharp taps on my shoulder rousing me from my sleep. “Sara, Sara, wake up—you’ll be late for work,” said the voice. With teary eyes I looked up and saw Pete looking back at me wearing his lavender shirt and black pants and radiant smile. I hugged him quickly. I woke up immediately. The dream I’d had reminded me how short life is and how, when I do lose Pete, I can’t cry over what we didn’t have but remember the good times we did have. Why did you get the second tattoo so soon? There are two answers to this question. The first is that I honestly miss the water and want to get back to swimming as soon as possible. The longer I space out getting the tattoos the longer I’ll have to wait to get back in the water. So, much like a lot of things in my life, I made the decision to get them done close together and get them done with because I knew they were things/experiences I really wanted to have done. The second answer is simply I just wanted it. 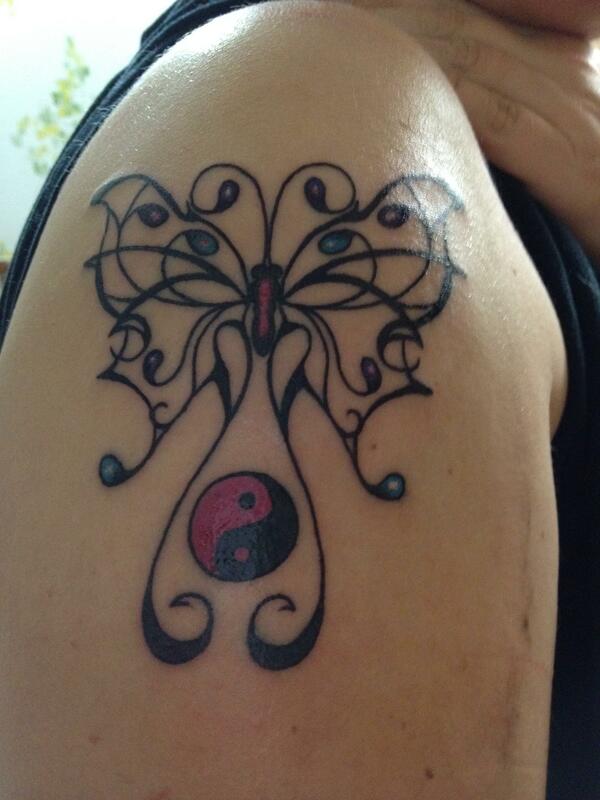 Right after I got the dragonfly I knew I wanted to get another tattoo. I was addicted. As I’ve heard before tattoos can be very addicting and it’s true. 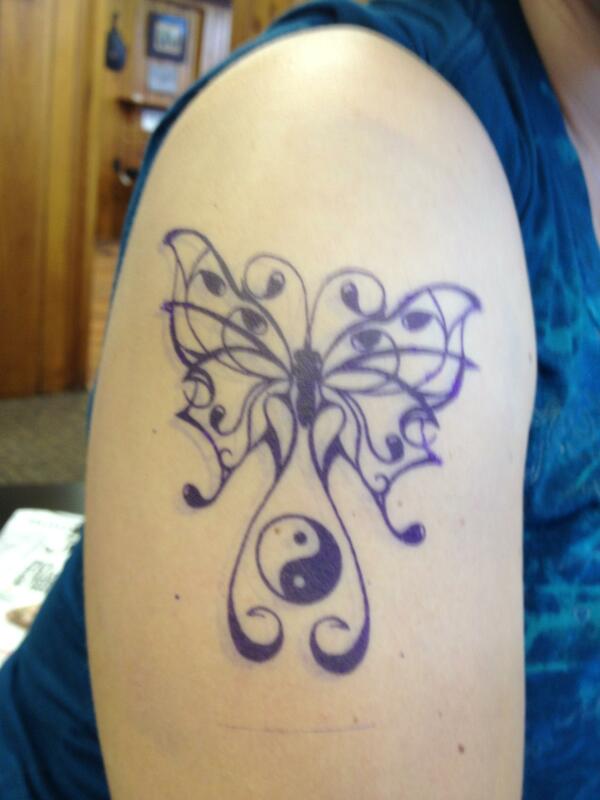 After I got the dragonfly I started looking for a design pattern for the butterfly tattoo. I called up Sacred Chao and scheduled my appointment! So I miss the water and I knew what I wanted and went after it right away. Athletics and tenacity—two words that really describe me. Shocker! Or maybe it’s not a shocker at all! Which tattoo do you like better? The dragonfly or the butterfly? That’s a tough question to answer. So I’m not going to answer it directly. I’ll answer it indirectly by saying I love the dragonfly because it was my first tattoo. It will always have that it-was-my-first tattoo. The butterfly is very cool looking. I love the outline with the minimal coloring that really pops. It doesn’t look like a traditional, cutesy butterfly which I really like. Will you be getting any more tattoos? I promised my friend Rachael that I would wait for her to get our next tattoos together. We are having a tattoo party. If anyone wants to come with us in the future let me know. I will be getting a hummingbird. If we can get the tattoos done after my half ironman next year then I may have a change of plans on what kind of tattoo I get when I go with her. I’m happy with the two tattoos I have at the present time! Who is your tattoo artist that does such fabulous work? Mallory who works at Sacred Chao Tattoo at 206 Elm Street, Valparaiso, IN 46383. Call (219) 531-2020 to schedule an appointment. Or check out their website by clicking here. Why do you like her so much and will you keep going to her in the future? I will definitely keep going to Mallory in the future. She does a great job. I would highly recommend her to anyone looking to get a tattoo (with vegan ink especially!) or body piercing in the future. Will you get any body piercings? Yes, I’d like to get a small nose piercing down the road but not yet. Mallory does piercings as well. I’ve seen her work and she does a great job. However, after finding out last night that it takes 12 weeks for that to heal that put a crimp on my body piercing dreams for now. That is way too long for me to be out of the swimming pool. I’ll get one next fall when I can take some time off from swimming. What did you name the butterfly tattoo and do you have a picture? The butterfly tattoo is named Borealis. The colors on her look like the northern lights and are subtle and beautiful. Yes I have two pictures for you. One is the outline before the colors go in and the other is a picture of Borealis with the colors filled in. Here’s the stencil outline Borealis before it goes gets filled in. Mallory makes a stencil drawing and puts the outline where the tattoo will go so she gets all of the lines right. Here’s a picture of Borealis all filled in an looking gorgeous. Great job Mallory! Lastly, can we read about the meaning of Borealis, the butterfly tattoo? Yes you can. Just go to this link here and you can read all about it! She woke up one morning slowly crawled and looked in the mirror. Not liking who she saw she realized she wanted to change it. She needed balance. She needed give and take. She needed change. She felt stuck and needed to fly. Crawling slowly from one place to the next with always the fear of being stepped on didn’t work anymore. She slowly started doing things to change. She started cleaning her act up. She started focusing on her inner beauty. She changed from a wicked princess into a glorious Queen. However this change didn’t metabolize overnight. She dreamed and hoped and wished at night that things would be different. She was ready to start anew. In her bed she cocooned. She stopped the long slumbers and woke up. Everyday was a new day. The work she put into each day was gruesome and giving and contagious. She started to affect people’s lives and they wanted to change with her. She was no longer the girl with the excuses. She woke up one particular morning and hatched out of her cocoon and felt as if she could fly. She felt like her hard work was finally paying off. It was as if she was radiant in color and majestic with wings that reached to a thousand seas. Beneath her was a yin yang symbol as she rose to the top of the world to remind her of the interconnectedness and interdependency we are and have on each other in the natural world. Through her transition she went from a caterpillar trying to find her way to a girl with a motive to work as hard as she could to find herself and her own personal journey moved with her along the way to hatch out of a cocoon to become the girl with the butterfly tattoo with the yin yang symbol beneath it to always remind her of balance. Papillon is French for butterfly. Tomorrow I am getting a tattoo of a butterfly with a yin yang symbol beneath it. I will post pictures. I wanted you to know in advance what it means to me! 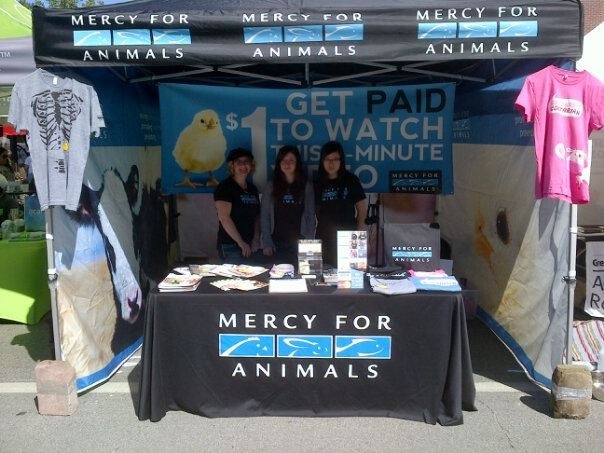 Mercy For Animals Internship Week Three! I just completed my third week of my MFA internship. I spoke with my boss and am pleased to report that my internship has been extended which I’m really excited about!!! I can keep going for as long as I’d like. I’m hoping to stay as an intern for a while longer and get more experience. An internship has been a great learning experience and a great way to get in on the ground floor of the animal activism field and learn from the bottom and I hope to work my way to the top. I feel joy and pride in having a sense of what I want to do with the rest of my life. We’ll see how this journey goes and where it will lead. It’s weird to think that it snowballed to an internship from an innocent party at SH Smile’s house called a Very Vegan Holiday! I’m glad I went to that party! Anyways, this week has been rather quiet. My duties have been promoted a bit from commenting on google articles to coming up with drafts for letters to the editor and finding articles in newspapers to send letters to. I’m still working on the Walmart Cruely campaign every day. My favorite thing to do is write blog articles and I got another shot at that this week! There aren’t a lot of blog opportunities but when there are they seem to come my way and I jump at the chance at them! We did another paid per view event outside a college dorm in the Chicago. I got to ride the elevated train for the first time. We took the brown line! I felt very Chicago-chic taking the train! The paid per view event was interesting. College kids, while you’d think they have an open mind, often think they’re too cool for the $1.00 we were offering them to watch the video. I was surprised. Leafleting was about the same. We handed out a lot of leaflets and were successful with the paid per view events but the vibe of the whole thing seemed off to me somehow. This week, as a fun side note, I got rear-ended by a semi on a hit and run in heavy traffic on my way home on Tuesday night on 80/94. Note to self: listen to the Magellan and take the alternate rout the next time it says there’s heavy traffic….it’s not joking. I was feeling some stress this week so I took some time off. I didn’t volunteer at any festivals this weekend. I spent some time with Pete. That’s part of the learning experience of having a 20-hour per week internship plus a full time job is learning how to balance things. We spent a relaxing weekend together just chilling. I feel more energized and ready to dive into more work now. I’m very excited that my internship has been extended and that I can keep going. I absolutely love what I am doing and am hoping I get handed harder projects as time goes on. I get bored so easily so the more challenging for me the project is, the better off I am and more likely I am to succeed. Five years ago, the night before his 40th birthday, Rich had a “moment of clarity” when he feared he was close to having a hear attack while walking up the stairs in his home. He vowed to transform himself by adopting a plant-based diet and nearly 6 months later entered his first Ultraman event. Adopting a vegan diet can lead to major changes in your life, whether it be weight-loss or meeting physical challenges, both of which Roll was able to do. I hope you’ll choose a vegetarian or vegan diet the way Rich Roll was able to do. What inspired you to get a tattoo? I honestly wanted one. A lot of people in the animal rights movement have representational tattoos and I think they’re cool. I’ve been scared for such a long time about getting one because of the pain. But I finally got past that was able to step up to the table and get the ink-jection! Did getting the tattoo hurt? I hate needles. I was scared of getting the tattoo. I realized at some point that I could do it because I’ve handled pain pretty well before. For instance, the marathon I did in Chicago 2011. I’ve never felt so much pain in the balls of my feet before at the last 3 miles. My body has never been in that much pain after an event before. I figured if I could handle that pain then, I could handle this pain now. The pain of the tattoo needles wasn’t nearly as bad as the feeling of my feet during the marathon and the achiness in my body after the marathon ended. Was anyone there with you when you got the tattoo? Yes, my husband went with me along with my good friend Rachael and her boyfriend Scott. Why was getting a tattoo with vegan ink so important to you? As a vegan, I wanted to have tattoos drawn with ink that represent my lifestyle. It would be hypocritical to get a tattoo with non-vegan ink and say I’m still a vegan. It’s like a vegan that walks around wearing a leather jacket. I’m trying to embrace veganism in all aspects of my life right now and I wanted to carry that over to the tattoo as well. Vegan ink was very important. Where sources do non-vegan ink come from? Do you have a picture of the dragonfly tattoo? Yes just click here to see her! Her name is Bella meaning beautiful. What’s the meaning behind the dragonfly tattoo? Was it just something cool to get or was there meaning behind it? I did some research and everything I read is summed up in this single paragraph as to why I chose the dragonfly below. I found this on someone else’s blog and re-blogged it. I thought it was a really interesting article. I feel that the changes I’ve gone through in the last 30 years have finally led to a new life for myself and the dragonfly, to me, represents the shedding of the skin and coming into a new, joyful life. Will you be getting another tattoo? If so, then when will you go? I have plans for 4 more tattoos. I’m getting a butterfly done. I have a consultation this evening with Mallory to see what she can do about designing a butterfly tattoo for me. I also want to get a hummingbird. The other two tattoos I have plans for I have to earn so I don’t know when I will be getting them. They will be the M-dot ironman triathlon tattoos. One will be for the 70.3 distance and the other will be for the 140.6 distance. I’m hoping that the M-dot can look pretty and not so masculine. I will not get those tattoos until I’ve completed these two events. The half ironman I’m planning on doing this coming fall 2013. The full ironman will most likely be in 2014 or 2015. Last question: Where did you get the tattoo done and would you recommend them? How’d you hear about them? I got the tattoo done at Sacred Chao at 206 Elm Street, Valparaiso, Indiana. Call (219) 531-2020. Here’s a link to their website. I heard about them because from my friend Sarah H. I was looking for a tattoo parlour that was local and used vegan ink. I posted this information on Facebook to see if anyone knew of a place and my vegan friend Sarah H. recommended Sacred Chao. I would highly recommend them. Mallory did my dragonfly tattoo and she did a fabulous job. As you know I’ve been interning at Mercy For Animals in Chicago for the last 2 ½ weeks now. I love it! I’ve already finished my hours for the third week. I have one more week to go. After the one month commitment, I do not know what will happen after that. I’m eager to talk to my boss to see what will happen after that. This past weekend I volunteered at an event with Pete called Riot Fest. It’s a huge rock band party in a park. It wasn’t my kind of music but it was really neat to volunteer. 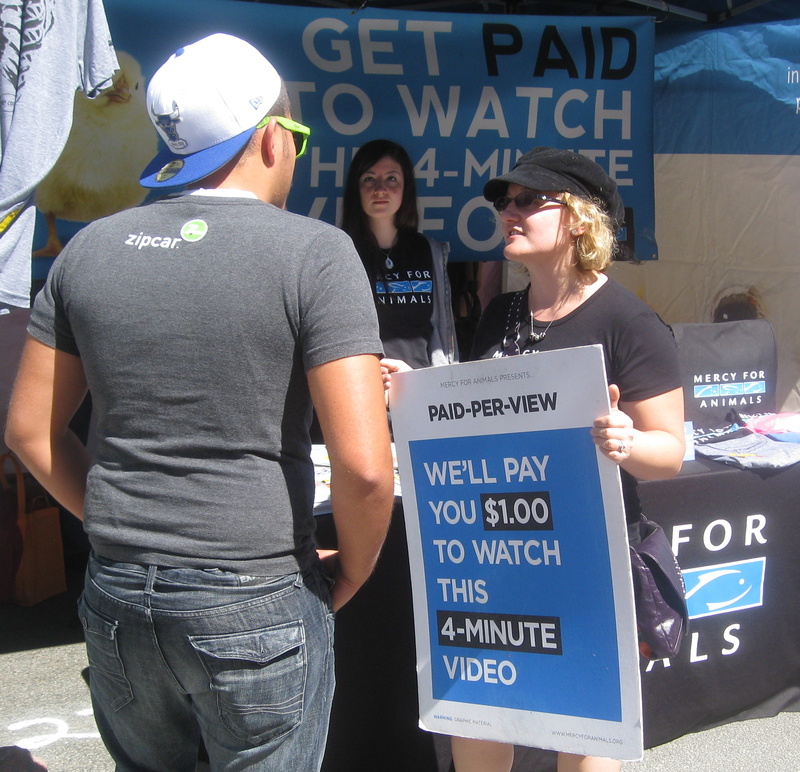 MFA interns teamed up with FarmUSA to help them out at their paid per view event. They have a giant truck with 10 screens and multiple headphones so we were able to connect with multiple at once. Some people just want the dollar and their eating choices aren’t affected by the video they see. Some will try and scam you by not listening with the headphones on their head and will be texting, in which case they do not receive a dollar. And others are completely moved and one lady even ran away from the video crying. I love doing paid per view events, an event where you get paid a certain amount of money to watch a video, because I love watching people’s reactions. If you like people-watching, then you’d definitely enjoy paid per view events and even leafleting. People’s responses always get me there as well. I’m still signed up for google alerts where I receive an alert about a pertinent article regarding veganism, animal cruelty, factory farming, etc. and I read and respond to it. I’m still scanning the papers for articles for letters to the editor. That is probably the thing I have the hardest time with. Lastly I’m helping Phil on his Walmart Cruelty Campaign against gestational crates for mother pigs. Phil Letten is on a nationwide tour and I look for veggie groups and animal advocacy groups to send letters to let them know when and where Phil will be campaigning in their area. The internship so far has taught me to be a better vegan….a kinder and more joyful vegan. I’m no longer the vegan that’s ready to ram carrots down your throat like I was when I wrote the Would Eat Your Dog and Drink Your Wife’s Breast Milk post. Although, to date, that’s still my favorite post, I understand why it’s so hard. Being on the other side I experience people that literally have no idea where their food comes from and it’s part of my job to educate them. If I’m successful at that job then I’m grateful for that. It’s not a victory but a joyfulness inside that I feel. This isn’t a game. It’s a journey for others to change and I’m glad I’m changing too! When I was going to my MFA internship on the first day I was approached by a person on the street holding a binder of children from 3rd world countries. He started explaining his organization which was ChildFund International right away, not giving me a second to speak. His name was Paul. Paul changed my life that day. Paul asked me if I’d seen the TV ads at 3am, when you’re watching TV and cannot sleep, about children who are starving in 3rd world countries who are starving and can be saved for just $1.00 a day. I told him yes and he asked me if I would like to sponsor Miriam. He gave me a picture of Miriam. Miriam Chebet is a femail from Kenya. I asked and all of the proceeds go directly to Miriam. I told Paul I would sign up. Holding that picture in your hand somehow makes it very real. Paul told me I could call and cancel within two weeks if I decided I didn’t want to sponsor her for a dollar a day. My first selfish thought was, “He’s doing the same thing I’ll be doing on my internship (leafleting). So I may as well show him some support and signup and I’ll just cancel later. I have two weeks to think about it.” Two weeks have nearly passed now and I’ve decided to keep Miriam and will sponsor her. I have a dollar a day. 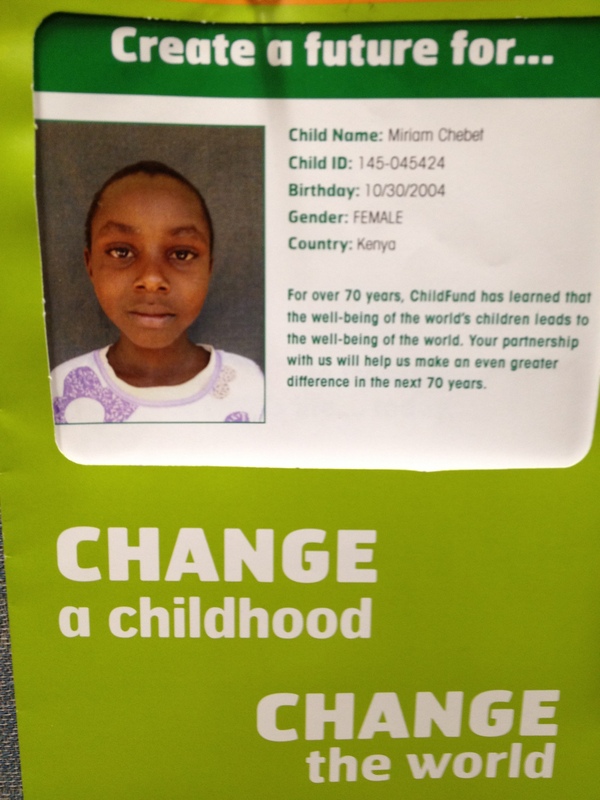 I make more than that in an hour and can can certainly afford to sponsor her. 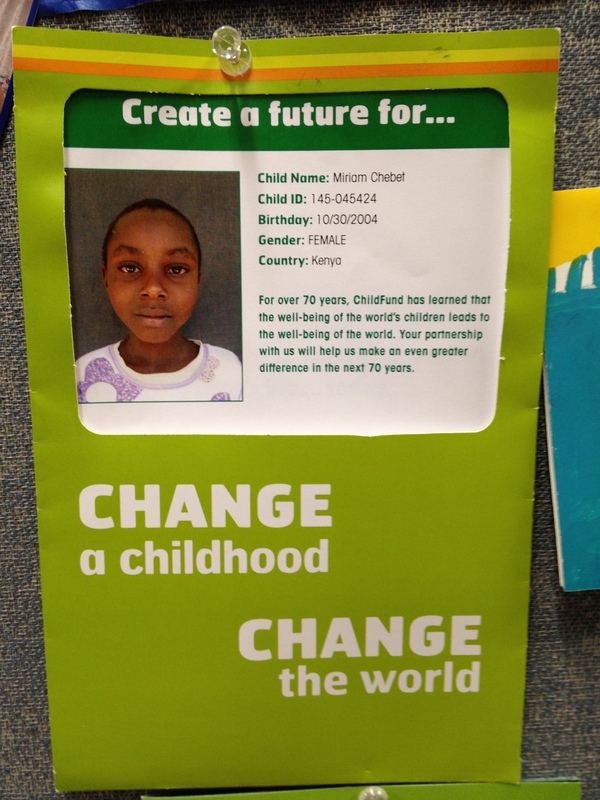 One thing that is cool about ChildFund is the kids write letters to their sponsors and send pictures. What’s even cooler is that I can write back. I read that it could take 16 weeks or so for the letters to get delivered but that’s okay. It just makes Miriam’s letter that much more precious. There are translators that will translate her letters to me and vice versa. So in effect I have a young pen pal! I’ve been grown and transforming so much this year and this is part of my growth process: doing something completely unselfish…not thinking of myself for once and thinking of someone else that I’ve never even met. 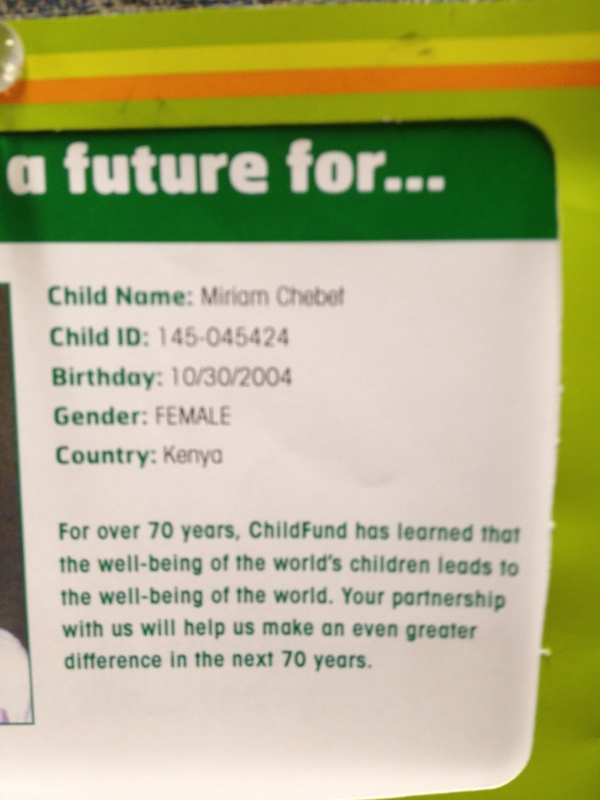 Here are some pictures of Miriam and click here to go directly to ChildFund’s website for more information. The picture of Miriam that Paul gave me that changed my life. The packet! I put her up at my desk at my job to remind me who I’m working for. It’s not just me anymore. An upclose and personal take on Mriam’s information! I feel so proud for what I am doing and I wanted to share it with you all. I have no children but I can at least sponsor one, even though it’s not my own child. It’s one way I can make a difference. This past Saturday 9/4/2012, I volunteered as part of my internship to work the table (hence the word tabling) for Mercy For Animals at the Renegade Craft Fair in Chicago. Like a huge nerd, I got up there way too early because I didn’t want to deal with Chicago traffic. I was also worried about being able to find food so I went to my favorite food place, Whole Foods, and got two Upton’s eggplant foccia sandwiches and 1 seitan bbq slaw sandwich plus one cup of coffee. Armed with my products I drove to the Renegade Craft Fair and proceeded to have a fantastic day! I ate two of the eggplant sandwiches and gave the seitan one to Mikael my supervisor. We aren’t supposed to tell Pete about this because Pete loves seitan. But I broke down and told Pete anwyways. 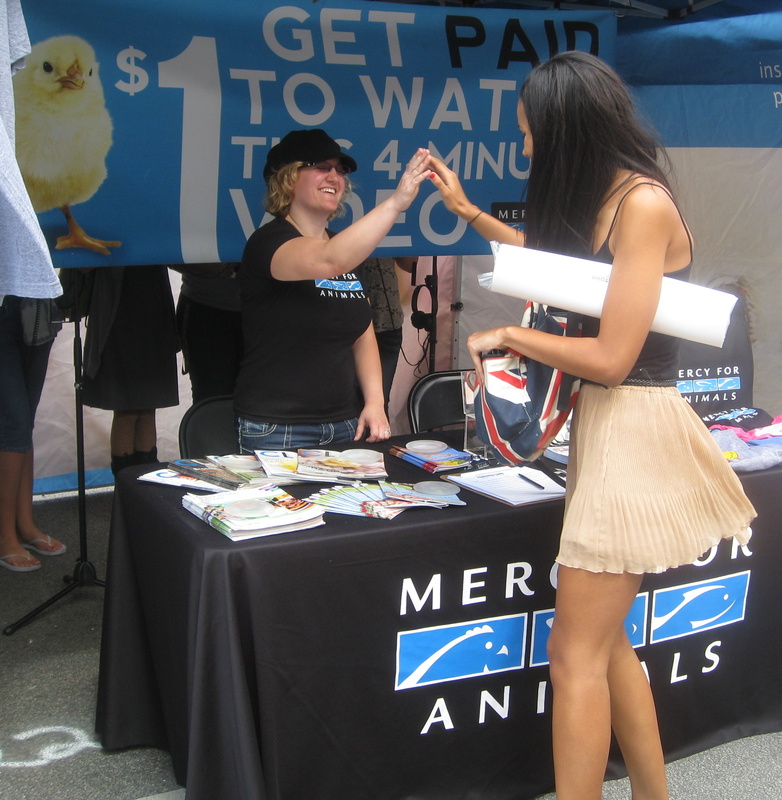 There are a lot of positions to fill when tabling for Mercy For Animals. 1. Holding the sign that says “We will pay you $1.00 to watch a 4 minute video.” Several people asked me if this was a gimmick or if I was serious. Who wouldn’t do anything for a dollar? It’s only four minutes. And it’s great spending money and can buy beer. When I was holding the sign these were the angles I used to try and attract people to our tent to get them to watch the video. This is called a paid-per-view event. We pay you to watch a movie. Here are pictures of me holding the sign and talking to people to get them to watch the vidoe. I had quite a few takers! This is me talking to the guy from Zip Car which was the tent next to ours. I got him to watch the video! Me holding the sign trying to lure people in. I worked and rocked that sign! For a person that was voted quietst in my class, I’m kind of a loud-mouth now! Something else that has to be done when tabling is actually working the table. This means getting people set up to watch the Farms to Fridge video. 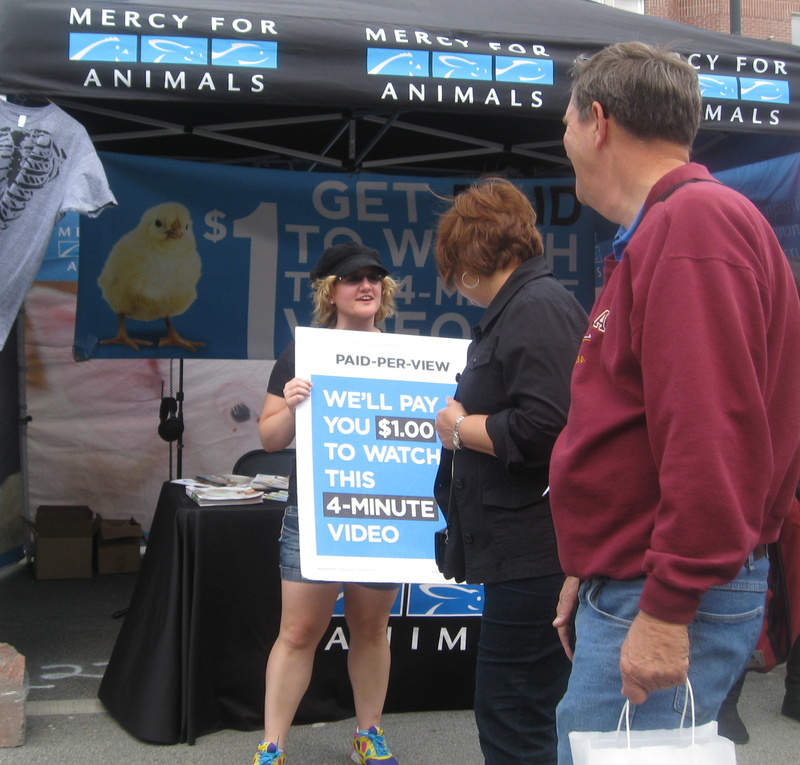 It also means passing out literature, getting email sign-ups for the e-mail list, selling t-shirts, giving out bumper stickers and also letting people know what Mercy For Animals is and what we stand for. This is me giving a high-five to someone that was already a vegetarian. I gave her some recipes from our ChooseVeg magazine to take home with her. The last thing we did is leaflet. I don’t have a picture of me doing that. Leafleting means passing out brochures to people as they pass by. Some people don’t have a clue what you’re giving them, some people take it and give it back and some people thank you for the information. I gave out a lot of brochures. What I found is asking, “Would you like some information on vegetarianism?” is an easy way to pass out a brochure versus saying, “Help stop factory farming.” or “Help stop animal cruelty.” While these are all causes we support sometimes a softer apporach works well with people to get them interested in what message you are delivering. Here’s the last picture of me and my fellow interns manning the table at the beginning of the day. What you won’t see is my spectacular sunburn I had by the end of the day! Pauline, Olivia and myself manning the table before the day started. Overall it was a really successful day. I enjoyed the experience and learned a lot!